Given current increase in urban biking, there is need for knowledge support and tools that may inform professional practices in traffic planning and urban design. This start-up project is a preparation for a larger research project on developing user-friendly and evidence based GIS software application in support of urban planning and design for bikeability. The aim of this study is to identify methods in GIS for measuring and combining different kind of impedances along bicycle routes. Examples of important bicycle impedances are density of intersections, congestions and topography. 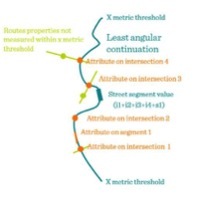 For calibrating the measures and for linking the analysis to real life experience, the measures can be transferred to impedance in travel time along routes. Speed impedance is here suggested to be an important attribute for not only understanding bicycle movement potential along routes. It is also an important bicycle network quality in itself and is often used as an attribute in cost benefit analyses. An understanding of spatial potential for bicycling speed, will also make it easier to balance the relationship between accessibility and safety for pedestrians and speed for bicyclists by street design. Even so, there is no method available today explaining the spatial conditions for speed impedance. Therefore, the development of a GIS based software, which is tested and verified by empirical studies, would likely be highly useful within the field of bicycle city development. This project is related to a research initiative on urban form and transportation at Chalmers, Gothenburg.